Two views of sidewalk on Eastern Avenue south from 43rd Street, top Jan. 14 and bottom, Jan. 24. Five more are included in Part 11 of this snow history. Seattle’s Wallingford neighborhood is one of “The Queen City’s” lower hills. On lofty Capitol and Queen Anne Hills almost any snow will hunker down the neighborhood. Jean, of this blog, offers a good example from 1985 when one of the city’s earliest cold and snow snaps hit and held through most of November. “That fall Karen and I invited a French friend to visit and stay with us in our home atop Queen Anne Hill. 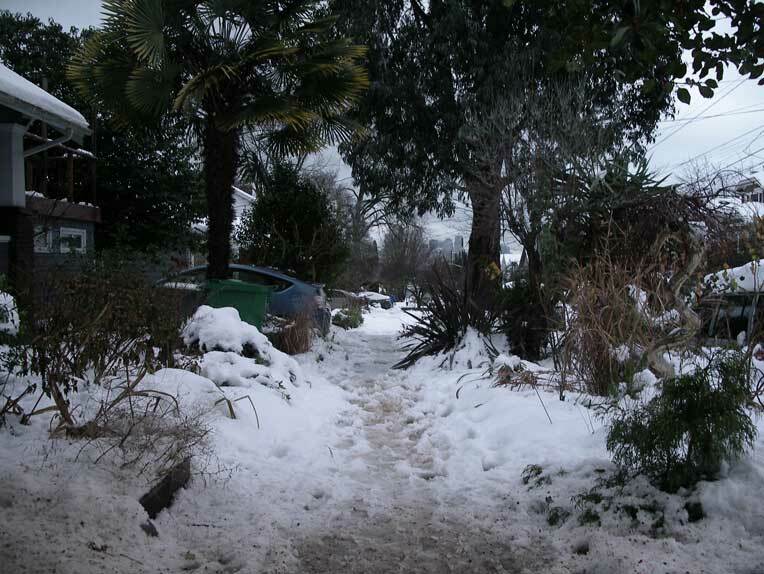 Soon after Arielle LeMoigne arrived our Mediterranean climate turned Arctic and did not let up. We were stuck. When Arielle returned to Paris in late November the Seattle impressions she carried with her were circumscribed by the snowbound summit of Seattle’s second highest hill.” This kind of stranding is not as likely in Wallingford. But this year is exceptional. We expect that with such a snow as this one comes curiosity about the weather. What other piles were dumped on the shores of our Mediterranean, and not by passing ships or sportsmen but by nature acting capricious. As often noted, rarely does anything happen here in a big way except temperance. We are too far north to be paradise, but we are not far enough in that direction, like Anchorage, to be hell. “In January 1870 strawberries and green peas were ripening in the open air on Thanksgiving Day?” That is a rare example of a pioneer remembering the salubrious and Puget Sound behaving, perhaps, too Mediterranean. With what follows we are enlivened more by the dangerous extremes of growing snow and memorable winds, cave-ins, and other natural evils like falling trees, flying pits, and sink holes. What follows will be more like going north to Alaska. I’ll first sample the opening lines of the earliest version of this short history – because I like them – and thereby briefly unlink, again, this chained chronology. and in retrospect rather boring. It is a frequent complaint of researchers who discover these valuable examples of first-hand witnessing to life first on the Oregon Trail and then on a homestead, that they are often filled with thermometer readings and little else. And for the most part they are testimonies to our enduring Puget Sound salubrity and mediocrity. For their first full winter on Elliott Bay – and at Alki Point – the weather was mercifully mild. 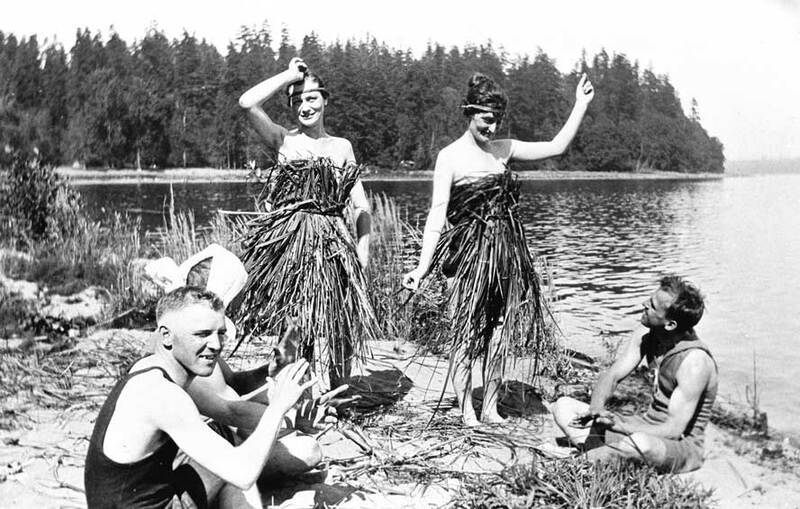 When the pioneers referred to Puget Sound as their “Mediterranean of the Pacific” it was from the authority of this happy season that they could readily draw. Since they did not carry cameras and neither were there any photographers waiting on the beach during the Denny Party landings at Alki Point in 1851 or on the East shore of Elliott Bay early in 1852 no photographs survive. This winter, on an especially windy night Arthur Denny lost his precious barrel of pork. He had left it on the beach above the highest tide, he thought. 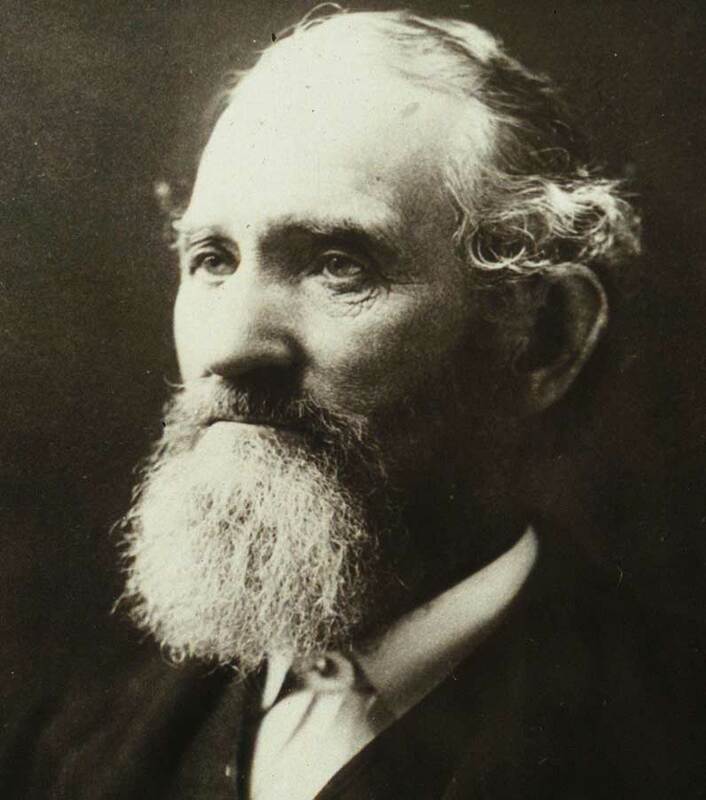 Writing in 1889 he recalled, “It was the last barrel of pork in what is now King County and the loss of it was felt by the whole community to be a very serious matter . . . We all turned out at low tide in the night with torches and searched the beach from the head of the bay to Smith’s Cove.” It was a loss like this that reminded those living on the shores of Puget Sound of the familiar maxim, “When the tide is out the table is set,” although it was not set that night with pork. Much later when writing his pioneer reminiscences Denny made note, “The pork has not yet been heard from.” Denny also reflected, “Some substantial life-supporting food can always be obtained on Puget Sound, though it is hard for a civilized man to live without bread.” In his “manner of speaking” Denny typically forgot the women. But it was they who quickly baked the “quick biscuits” when after breadless months ships carrying flour arrived. If they came at night, the noise made from their falling anchors would act like an alarm clock no matter the hour, and everyone would stand out from their warm beds to wait for quick biscuits. The winter of 1861-62, pioneers the length of Washington Territory agreed, was the “hardest.” Its effects here in Seattle, at least, were still not recorded although might have been were it not for the mortality of Seattle’s first photographer, E.A. Clark. 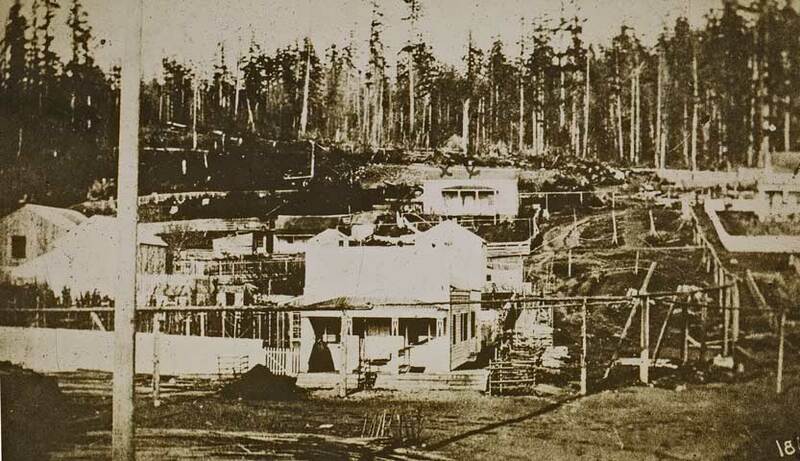 Apparently, the earliest surviving photograph of Seattle is dated 1859. It is of Henry and Sarah Yesler’s home at the northeast corner James and First in Pioneer Place (or Square if you prefer). It is, I believe, a “conventional date” for I have never come upon any evidence that confirms it, such as a first person description by Clark, the sometime school teacher, and justice of the peace. Clark also took a second surviving photograph of Seattle: another portrait of the Yesler Home. It shows some additions that were probably made in the winter of 1859-60. Most likely E. A. Clark made other daguerreotypes, and most of them would have been portraits, for personal vanity and/or identity has ever been the greatest market for photographs – not cityscape. The daguerreotype, this earliest of truly functional photographic processes, was introduced to the French Academy in 1839 and purchased by it for “posterity.” It produced finely detailed images that were one-of-a-kind and so not repeatable, unless themselves copied. That is, there was no negative to make multiple identical copies from the same source. Every daguerrotype was more than rare, it was peculiar. And they were also easily broken. In sum Clark may have made numerous impressions hereabouts but, apparently, none of them survive except the two “portraits” of the Yesler home, and perhaps Clark’s own self-portrait. And these two – or three – are themselves copies. The original glass-front recordings in all their singular jewel-like clarity do not survive. Surely no Clark picture of our coldest season survives, for by then the photographer had himself been cold for months. Clark died soon after he took the second impression of the Yesler home. He was still a young man. 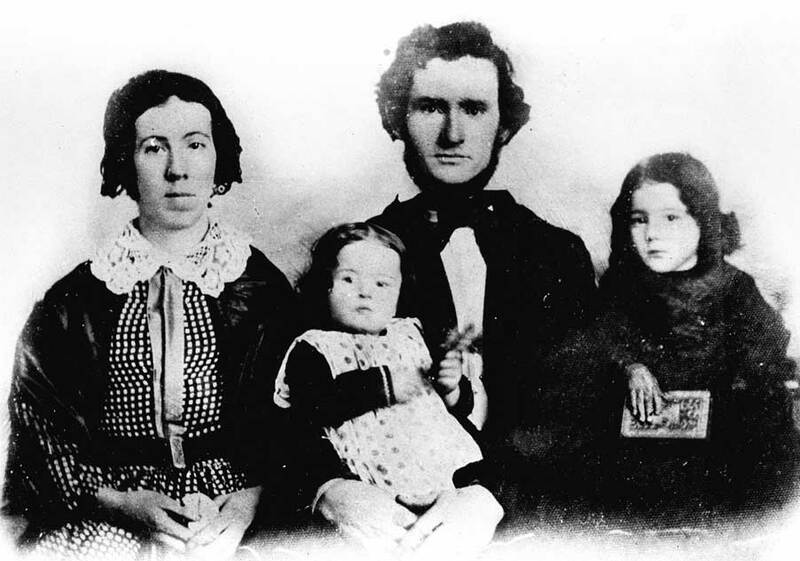 An April 27, 1860 Pioneer and Democrat obituary noted that “he had been engaged in the Daguerrean business for several years and leaves numerous traces of his skill in that art. He was about 32 years of age and leaves numerous friends to mourn his loss.” If the Olympia newspaper’s report is correct then we may mourn also the loss of his work and wonder what might have been revealed. 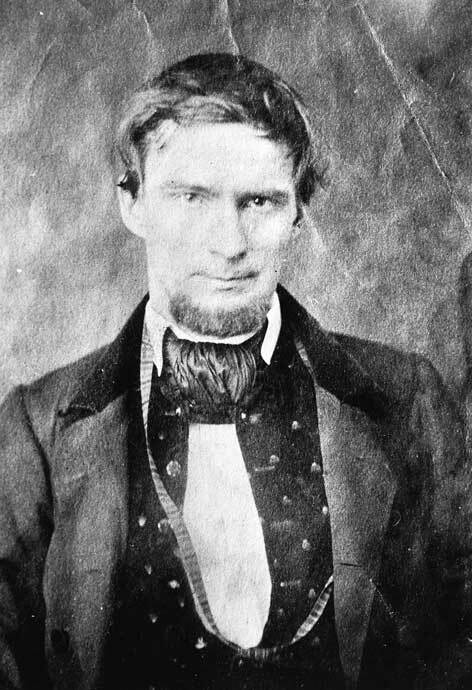 Clark came to Seattle very early, in 1852. 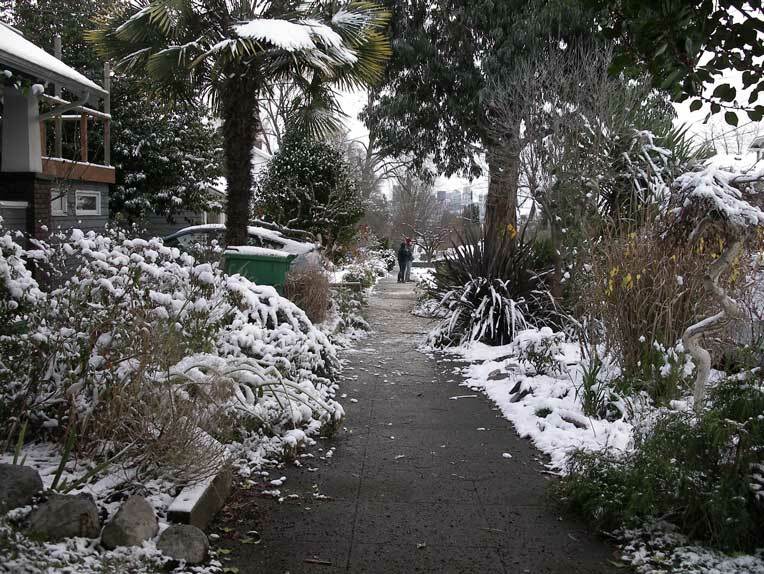 The hardest winter started with heavy rains and flooding, and then it snowed and snowed. The ground was hidden for three months. Lake Union froze over and piled with snow. Green Lake, what little was known of it, was also covered. Nature was consistently cruel. Feed was exhausted and statewide there was wide destruction of both livestock and vermin. In Seattle the men, at least, could keep warm helping build Henry Yesler’s first sawmill near what is now the northwest corner of First Avenue and Yesler Way. The mill was ready late in March and began cutting on the 26th. Most of Seattle’s pioneers worked for Yesler in those first years of the community.